If you’re like me in the Summer time, you’re pressed for time six days out of seven. It’s too hot for the crockpot or the stove, and taking the time to prep and cook something is a pain. My summer meals consist more of “season and toss on the grill” or “marinate and toss on the grill”, which, is all fine and dandy. Choosing sides to go along with it becomes a task in itself. As a clean eater, I tend to like my sides quick and simple. One of my favorite go-to’s is quinoa and veggies. Not only do you get all of the amazing benefits of vegetables, but you get the wonders of the “super grain” quinoa. Quinoa is one of the most protein rich foods you can eat. So, in terms of a good post-workout food? It’s golden. It also has almost twice as much fiber as most other grains. It contains lysine (key for tissue growth and repair), iron (keeps those red blood cells healthy), magnesium (does several things, but key is produce energy), B2 (improves energy metabolism within brain and muscle cells) and manganese (antioxidant). Good warm or cold, mixed with a main dish, as part of a side or even in salads. This recipe here is quick and easy, and pairs excellent with grillable dinners! Remember, the fresher the vegetables, the better. At the same time, fresh/farm stand veggies can be pretty pricey, especially if you go organic/non-GMO like I do. BUT, you can substitute frozen veggies if you need to, or if you’re non-specific on organic vs. non, that’s fine too. It’s all a personal preference. Boil water in a small pot on med/high heat. Add in quinoa. Let it come back to a boil, cook for about 3 minutes like that before reducing to a simmer. Cover. 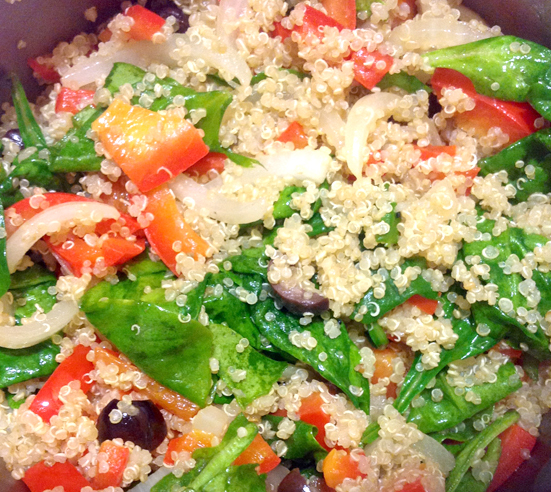 While quinoa is cooking, in a small skillet on med/high heat, add extra virgin olive oil, onions and peppers. Cook for 5 minutes, then add olives. Cook for another 5 minutes. Once quinoa is done, add spinach, then the rest of the cooked vegetables. Mix well and serve warm or cold.